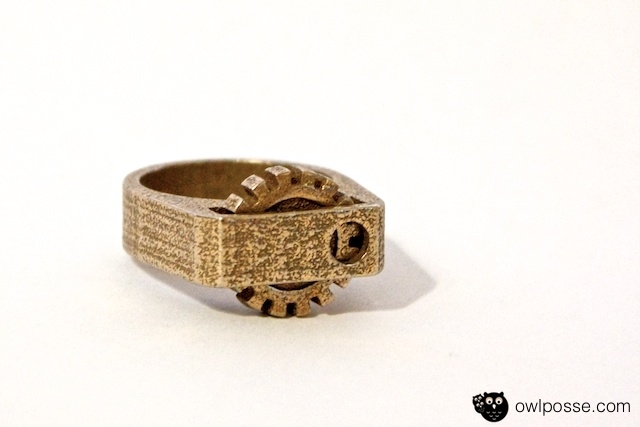 Owl Posse » Blog Archive » Viral Gear Ring! Just this week I shared one of my jewellery designs on the Shapeways forum as I was pretty excited to arrive at the final design, ready for sale among my other items still in the works. I didn’t expect Shapeways to put the pictures on their Tumblr account though. I was so pleased that they wanted to share it and I also didn’t expect so many reblogs! Thanks for the support and encouragement, it’s great to know others share my enthusiasm in fun jewellery! Really neat ring. I already have the Kinekt Gear Ring (www.kinektdesign.com), but I might have get this one too. Keep us posted please! I am absolutely obsessed with this ring!